Corals, together with their endosymbiotic Symbiodiniaceae, are known to exhibit a suite of mechanisms for survival under stressful conditions. However, exactly how the host animal responds to varying environmental conditions remains unclear. In this study, we tested two relevant environmental factors that can have deleterious effects on corals: heat and sediment. We examined among-genotype responses of Pocillopora acuta to these factors with RNA-Seq in concert with widely-used tools for assessing the physiological conditions of corals. Heat and sediment treatments were applied in a 2 × 2 crossed experimental design: (1) ∼30°C without sediment (control, “C”), (2) ∼30°C with sediment (sediment-only, “S”), (3) ∼32°C without sediment (heat-only, “H”), (4) ∼32°C with sediment (heat + sediment, “H+S”) over four consecutive days (3-h daily exposure) in ex situ aquarium conditions. 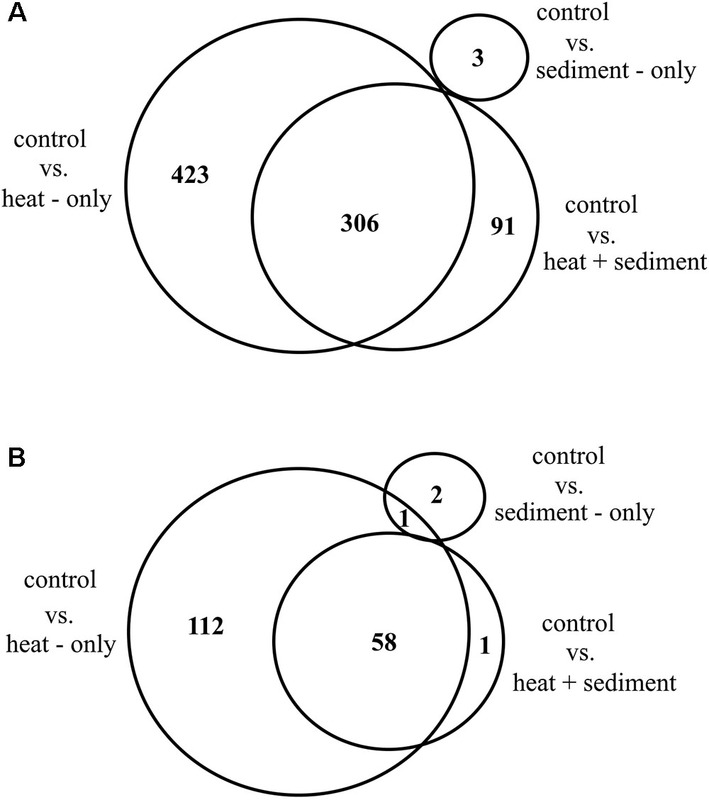 A clear differentiation in gene expression patterns was observed in corals exposed to heat alone and to heat with sediment, relative to the control treatment. Few transcripts (∼3) were found to be differentially expressed for corals exposed to sediment only. The greater impact of heat was supported by photo-physiological measurements that showed significant effects on maximum quantum yield and average symbiont density among genotypes of P. acuta. The combined effect of heat and sediment caused a greater reduction in average symbiont density than the effect of sediment alone. Furthermore, “H+S” disrupted the ability of corals to maintain processes involving assembly and disassembly of cilium which suggests a synergistic effect between the two factors. We also found that host-specific genes which were expressed differentially may not be related to their interactions with algal symbionts. Rather, these genes are involved in a variety of biological functions including, but not limited to, cilium biogenesis and degradation, cilia motility, innate and adaptive immune responses, cell adhesion and bone mineralization, and processes involved in the cell cycle. These results reflect the complex response of the host alone. Overall, our findings indicate that acute heat stress in tandem with sediment can depress photo-physiological performance and trigger considerable changes in host gene expression. Coral communities situated in nearshore coastal waters are often exposed to stressful conditions generally linked to adjacent land-based activities. For example, land reclamation and port construction, which generally involve dredging, can cause elevated levels of turbidity and increased sedimentation rates in inshore reefs (Erftemeijer et al., 2012). As corals are generally sessile, they are unable to move away from such adverse conditions. Elevated levels of sediment can affect their photosynthetic performance due to light reduction when colony surfaces are covered with sediments or because of reduced light penetration caused by suspended solids (Falkowski et al., 1990; Anthony and Fabricius, 2000; Anthony and Connolly, 2004). Smothered corals expend energy clearing sediment off their tissues and their feeding activity can also be impaired (Rogers, 1990; Fabricius, 2005; Erftemeijer et al., 2012). Disturbances caused by sediment exposure have caused coral loss in numerous locations such as Bahrain (Zainal et al., 1993), Hong Kong (Hodgson, 1994), Thailand (Brown et al., 1990; Chansang et al., 1992), and Singapore (Hilton and Manning, 1995; Chou, 2006). Large-scale climate change-related processes such as ocean warming can amplify local anthropogenic stressors, including high sedimentation and turbidity levels, resulting in greater environmental pressure on coral communities (Hoegh-Guldberg et al., 2007). Both heat- and sediment-related impacts can occur at various temporal scales, from long term (chronic) to brief but severe (acute) events. Acute heat stress due to anomalous sea surface temperature can cause corals to bleach and result in mass mortality (Baker et al., 2008; DeCarlo et al., 2017). Bleaching is an obvious manifestation of a stress response in corals due to the dissociation of symbiotic algae (Buddemeier and Fautin, 1993; Glynn, 1993). The global pattern of coral bleaching events associated with thermal anomalies shows more frequent recurrence with increasingly shorter time intervals for recovery of affected coral reefs (Hughes et al., 2018). Moreover, acute sediment stress events characterized by short-term high turbidity and/or high levels of downwelling sediments incur high energetic costs (Brown and Bythell, 2005; Browne et al., 2014), with the ultimate consequence of reduced energy for coral growth and reproduction (Fabricius, 2005). Recurrent coral bleaching events on top of local sediment impact raise a major concern regarding the capacity of existing coral assemblages to withstand multiple stressors. It is well understood that survival mechanisms of corals in response to different stressors can vary considerably both among and within species due to differences in their life history strategies, along with other biological attributes (Yap et al., 1992; Todd et al., 2001; Darling et al., 2012; Lui et al., 2012). Previous studies on the physiological responses of corals to stress have highlighted the acclimatization capacity of the coral host, such as induction of heat shock proteins and regulation of enzymatic activity (Brown, 1997). Maintenance of protein turnover is a known acclimatization mechanism in several coral species (Sharp et al., 1994; Black et al., 1995; Fang et al., 1997). Symbiotic corals, in particular, can also acquire essential amino acids through translocated nutrients from their algal symbionts (Hoegh-Guldberg, 1999). The close relationship between coral hosts and their photosynthetic algal symbionts (currently referred to as Symbiodiniaceae; LaJeunesse et al., 2018) adds to the complexity of coral responses and survival strategies. Both the host coral and algal symbionts have inherent physiological attributes that enable them to survive under varying environmental conditions (Roth, 2014). However, due to the obligate nature of the symbiosis, exactly how the host animal responds to varying environmental conditions remains unclear. Today, rapidly evolving technologies such as high-throughput sequencing of DNA have revolutionized the way coral scientists study responses of organisms to environmental changes (reviewed in Sweet and Brown, 2016). Highly sensitive and accurate genomic approaches have provided tools not only for biomedical sciences to identify causes of diseases, but also for ecological studies such as those attempting to identify responses of corals to various stressors. For instance, RNA sequencing, or RNA-Seq, is a relatively recent high-throughput sequencing approach that generates data for transcriptome-wide profiling suitable for non-model organisms such as corals (Kenkel and Matz, 2016). This approach offers advantages compared to previous first-generation approaches (e.g., quantitative polymerase chain reaction and microarray) as it produces very low background signal and a large range of transcript expression levels with high accuracy and reproducibility (Wang et al., 2010), and is therefore more cost-effective. The availability of genomic and transcriptomic data for both coral host and symbionts also allows independent examinations of these separate components. Indeed, transcriptome-wide profiling has changed the way coral scientists approach important biological questions as it provides information on the entire suite of transcripts that are regulated across different environmental conditions. This approach is particularly useful for examination of the physiological state of organisms (Evans and Hofmann, 2012) and their capacity to survive under different levels of stress. Here, we employ RNA-Seq to characterize the gene expression patterns of corals collected from the highly-urbanized reefs of Singapore. The long history of coastal modification in this tropical island nation since the 1960s has resulted in a ∼60% loss of coral reefs (Hilton and Manning, 1995). Contemporary levels of turbidity and sediment accumulation on local reefs can reach up to 150 mg l-1 and 37 mg cm-2 day-1 respectively (Browne et al., 2015). Even the reefs furthest from coastal development experience sediment exposure that is considered beyond “normal” levels (i.e., >10 mg cm-2 day-1; see Rogers, 1990). This level of sediment pressure can severely affect the physiology and survival of reef corals. For instance, Browne et al. (2014) quantified the effects of 2-h acute sediment stress events on three coral species common in Singapore (Merulina ampliata, Pachyseris speciosa, and Platygyra sinensis) and reported a significant reduction in net energy production for all three species examined. This was attributed to a decrease in photosynthesis caused by high turbidity and low light availability. Furthermore, warmer periods in 1998 and 2010 coinciding with El Niño events where sea surface temperature level rose ≥ 1°C above the maximum monthly mean in Singapore (29.86°C) (National Oceanic and Atmospheric Administration Coral Reef Watch, 2000) caused mass coral bleaching on Singapore’s reefs (Guest et al., 2012, 2016), adding to the suite of pressures they experience. These episodes are becoming more frequent in recent years and have affected a wide range of coral taxa (Chou et al., 2016). In this study, we profile transcriptome-wide gene expression patterns and photo-physiological responses of a common coral, Pocillopora acuta, following acute exposure to the two major environmental factors associated with coral stress in Singapore: heat and sediment. Specifically, we: (1) test the separate and combined effects of heat and sediment exposure on photo-physiological performance and gene expression patterns in P. acuta; (2) characterize the functional profiles of the differentially-expressed genes; and (3) determine whether the responses vary among coral genotypes. Pocillopora acuta Lamarck, 1816 can be found on most reefs in Singapore (Poquita-Du et al., 2017). Owing to its weedy life-history strategy (Darling et al., 2012), it is believed to allocate more energy toward growth than survival responses to environmental changes (Pinzon et al., 2014). The genus Pocillopora was previously categorized as one of the most susceptible to thermal stress (Loya et al., 2001; McClanahan et al., 2004), however, recent observations during coral bleaching events in Singapore identify Pocillopora as one of the least affected genera (Guest et al., 2012; Chou et al., 2016; Poquita-Du et al., 2019). A total of eight adult colonies (called genotypes hereafter) of P. acuta (∼25 cm maximum diameter) were collected from three reef sites (∼4 m depth) in Singapore’s southern islands (Table 1). The colonies were immediately transported to the outdoor aquarium facilities at St. John’s Island National Marine Laboratory and kept in a flow-through system for 5 days of acclimation. Each colony was cut into 12 fragments (∼6 cm maximum diameter) and attached individually on cement tiles using epoxy putty (Alteco EpoPutty). The coral fragments (N = 96) were placed in a holding tank for another round of acclimation (5 days) to recover from any fragmentation stress. Table 1. Colonies of Pocillopora acuta collected from different sites in the southern islands of Singapore. Heat and sediment treatments were applied in a 2 × 2 crossed design (n = 3): (1) ∼30°C without sediment (control, “C”), (2) ∼30°C with sediment (sediment-only, “S”), (3) ∼32°C without sediment (heat-only, “H”), and (4) ∼32°C with sediment (heat + sediment, “H+S”). Mini-vortex resuspension tanks (mVorts; Figure 1A) with a motor-driven paddle combined with an air-lift system (described in detail by Browne et al., 2014), were used to create the sediment regime. The mVorts were placed in two separate water baths (six in each water bath), one maintained at ∼30°C and the other subjected to heat (∼32°C) using aquarium heaters (Eheim Jager) (Figure 1B). Heat exposure was adjusted in a stepwise manner (increment of 1°C h-1) until the water temperature reached 32°C and was then maintained for 3 h [from 12:00 PM – 3:00 PM; Supplementary Figure (SF) 1A]. The duration of the experiment was based on previous hourly water temperature records (unpublished data) during warmer periods where temperature tended to be higher only around noon. In a pilot experiment, P. acuta coral fragments were subjected to continuous exposure at 32°C but the corals bleached the following day. Therefore the ‘treatment’ conditions were designed to investigate how these organisms deal with non-lethal thermal anomalies. Sediment was added to three mVorts at each of the two temperatures. The procedure for sediment exposure was adapted from Browne et al. (2014) which used silicon carbide (Si2C) as artificial sediment to avoid any confounding factors from using natural sediments (e.g., microbial organisms). Browne et al. (2014) developed a mixture of different grit sizes of Si2C which matched Singapore’s reef sediment profile. The present study used the same mixture and amount (∼25 g) placed in each mVort. To simulate acute sediment stress events, sediment was forced up the central hollow tube of the mVort by means of full air bursts at 30-min intervals. The environmental conditions (temperature and light levels) inside the mVorts were continuously monitored for the entire duration of the experiment using HOBO pendant temperature/light loggers (Onset HOBO UA-002-08) set to log every 5 min. Average light levels inside the mVorts exposed to a sediment event dropped from ∼70 to ∼21 μmol photons m-2 s-1 (Supplementary Figure 1B) immediately after the sediment event. As sediment started to settle, the light levels gradually increased until the next event was triggered. Figure 1. Experimental setup showing (A) mini-Vortex resuspension tank (mVort) which was used to simulate sediment stress event and contained three P. acuta fragments from different genotypes; and (B) Two separate water baths containing the mVorts which were held at two temperature levels (30 and 32°C). In each water bath, three mVorts were exposed to sediment (i.e., with sediment) while the other 3 were not (i.e., without sediment). Due to the limited number of mVorts (12), the experiment was conducted in three batches. Each batch was run for four consecutive days and the entire experiment was completed in approximately 3 weeks. Three fragments from different genotypes were placed in each mVort, so 36 fragments were used per batch of the experiment. Within each batch, three genotypes were represented in each of the three treatments and control; beyond this caveat, all fragments were assigned to mVorts randomly. A portable diving PAM fluorometer (Walz) was used to measure maximum quantum yield [Fv/Fm = (Fm – Fo)/ Fm] (Beer et al., 1998). Before the start of the experiment, rapid light curves (RLCs) were performed for all coral fragments to assess their photosynthetic performance over a wide range of ambient light intensities. All of the coral fragments were able to maintain high photosynthetic performance over the course of RLC, suggesting the corals were in good condition. To determine the effects of heat and sediment exposure on coral photosynthetic efficiency, maximum quantum yield was measured at the end of experiment. The corals were placed in the dark (in glass beakers covered with black cloth) for 20 min prior to measurement to relax the photosynthetic reaction centers. Five measurements from different branches (upward pointing terminal branch) of each coral fragment were taken, keeping a constant distance of 5 mm between the optical probe and coral surface. The minimum fluorescence (Fo) was measured by applying a weak measuring beam of < 1 μmol photons m-2 s-1, followed by a saturating pulse of light > 1000 μmol photons m-2 s-1 to measure maximal fluorescence (Fm). The five measurements were then averaged for each sample coral fragment. Coral nubbins (∼2 cm) were clipped from each coral fragment at the end of the experiment for measurements of Symbiodiniaceae density and chl a concentration. All samples were individually wrapped in foil and kept on ice before being frozen at -80°C in the laboratory. Symbiodiniaceae were extracted following Ben-Haim et al. (2003). Coral tissues were stripped from their skeleton using a Waterpik water flosser with UV-filtered seawater (UV-fsw). The resultant slurries were filtered through 50 and 15 μm mesh to remove mucus and minimize clumping of cells. The slurries were centrifuged at 20°C for 30 min at 3220 × g to obtain an algal pellet which was then resuspended in 5 mL UV-fsw. The samples were mixed thoroughly by vortexing the tubes before taking aliquots of 1 mL for enumeration of Symbiodiniaceae. The remaining 4 mL was kept for subsequent chl a analysis. To reduce clumping of cells and for ease of counting, the aliquots were passed through a 27G × 0.5-inch syringe until no visible clumps were seen. Neubauer Improved Haemocytometer was used to count the number of Symbiodiniaceae cells inside the five squares under a compound microscope, performing eight replicate counts for each sample aliquot. Symbiodiniaceae density was calculated and normalized to coral surface area which was measured using the image analysis software, CPCe V4.1 (Kohler and Gill, 2006). Following enumeration of Symbiodiniaceae, sample tubes containing the remaining 4 mL algal suspension were centrifuged to obtain algal pellets. The supernatant was discarded, and pellets were resuspended in 100% analytical grade acetone. The sample tubes were wrapped in aluminum foil and left to stand overnight at 4°C for chl a extraction (Siebeck et al., 2006). Pigment absorbance readings were measured at 630, 663, and 750 nm using a spectrophotometer (UV Visible Spectrophotometer UVmini-1240, Shimadzu, Japan). The concentrations of chl a per sample was calculated using the equation from Jeffrey and Humphrey (1975) and normalized to coral surface area. To examine the effects on coral photo-physiological performance, the data were analyzed using mixed effects models in R statistical software (R Core Team, 2014). Both Fv/Fm and chl a concentration (continuous data) were fitted to linear mixed-effects models, while count data for Symbiodiniaceae density were fitted to a generalized linear mixed-effects model using Poisson error distribution. The models included fixed effects (genotype, temperature, and sediment) and random effects (batch and mVort). Stepwise model simplification and selection followed the Akaike Information Criterion to obtain the final model that best explained the variation. Immediately after the first batch of the experiment, ∼2 cm pieces were removed from all 36 coral fragments [three genotypes (G1, G2, G3) × four treatment/control conditions × three replicates] and placed in individual sample tubes pre-filled with RNAlater (Thermo Fisher) for stabilization. The sample tubes were inverted to mix for ∼30 s and kept at 4°C overnight to allow complete penetration of RNAlater into the coral tissues. The tubes were subsequently stored at -30°C until RNA extraction. Total RNA isolation was performed using TRIzol (Life Technologies), following the manufacturer’s protocol with modifications based on Barshis et al. (2013). Quality of RNA was examined using gel electrophoresis, yield quantified using Qubit RNA (Broad-Range) assay kit, and quality assessed based on good RNA integrity number (RIN ≥ 8). Illumina-based cDNA library preparation was carried out for each sample. All 36 cDNA libraries were pooled and sequenced across three separate lanes (i.e., 36:36:36) on the Illumina HiSeq 2500 platform for 250-bp paired-end sequencing under the rapid run mode. To allow consolidation of the entire set of transcripts for each genotype, all sequence reads from the same genotype (regardless of experimental treatments) were combined and assembled, de novo, using Trinity version 2.2.0 (Grabherr et al., 2011; Haas et al., 2013). Quality trimming (removal of poor-quality reads with Phred quality score < 20, and adapter sequences) and normalization of reads were performed using Trimmomatic, a built-in tool in Trinity. Gene expression profiles are known to vary among coral individuals (Seneca et al., 2010), and unaccounted biological variation can be mistaken as differences in gene expression profiles due to treatments (Hansen et al., 2011). Therefore, the approach of constructing an individual reference assembly (de novo) for each genotype was employed to account for inherent biological variability. It is important to note that in this study we are taking a functional approach with respect to the responding gene families. Therefore, identification of exact gene copies involved in the responses is not necessary (Rittschof and Robinson, 2016). Transdecoder (V 3.0.0) was used to identify open reading frames (ORFs) in the assemblies to aid in gene prediction. Redundant transcript sequences were removed using the CD-HIT tool1 through clustering analysis of transcripts that showed 100% nucleotide sequence similarities for both strands. To identify transcripts which were putatively coral in origin, de-duplicated assemblies (i.e., containing only unique transcripts) were aligned to predicted protein assemblies from existing genome and transcriptome sequences of 20 hard coral species (data source2) using blastp, retaining only matches with expected value (e-value) of ≤ 1e-5. To avoid taxonomic mis-assignment of ORFs, sequences which may have belonged to algal symbionts were filtered by mapping the obtained assemblies from the above step to available genomic resources of three Symbiodiniaceae taxa [Breviolum minutum (Shoguchi et al., 2013), Symbiodinium microadriaticum (Aranda et al., 2016), and Fugacium kawagutii (Lin et al., 2015)]. Subsequently, ribosomal RNA (rRNA) contamination was removed based on nucleotide sequence similarity (blastn, evalue ≤ 1e-5) to curated rRNA data3 (Lagesen et al., 2007). The remaining sequences after the filtering steps were designated as final ‘coral-only’ reference assemblies. Differential gene expression (DGE) analysis was performed using the RNA-Seq Analysis tool in CLC Genomics Workbench (V 10.0.1) which employed empirical analysis of DGE (EDGE) (Robinson and Smyth, 2008; Robinson et al., 2010). Individual sample reads were mapped to their corresponding reference assemblies to obtain expression counts (mapping parameters: mismatch cost = 2; insertion cost = 3; length fraction = 0.8 and similarity fraction = 0.8). The test performed three pairwise comparisons to examine the effects of experimental treatment on gene expression relative to the control. The pairwise comparisons included: (1) “C” vs. “S” (2) “C” vs. “H” and (3) “C” vs. “H+S”. The test used raw expression counts and implemented normalization of these counts to account for sequencing depth and differences of transcript lengths. Gene expression profiles of different experimental conditions for each of the genotype were visualized with principal component analysis (PCA) plots and heat maps in CLC. Differentially expressed transcripts (DETs) were analyzed based on the assumption that count data followed a negative binomial distribution. False discovery rate (FDR) was used to correct for multiple comparisons and was controlled at 5% (proportion of false positives). All DETs from each pairwise comparison for each genotype were aligned to known protein sequences curated in the Uniprot Swissprot protein database using blastx with a threshold e-value of ≤ 1e-5. Translated sequences that matched the same protein were assumed to be identical genes performing the same function and therefore originated from the same gene locus (Supplementary Table 1). Only annotated DETs that were present in all genotypes were presumed to be the core genes involved in the response mechanisms, and thus designated here as DEGs. The available information from all significant blastx matches (i.e., protein accession id) was then used to annotate the DEGs with likely functional profiles [i.e., Gene Ontology (GO) terms] based on UniProtKB4. Heat significantly affected both maximum quantum yield (Fv/Fm) (DF = 31, F-value = 21.857, p-value = 0.0001) and average symbiont density (estimate = -1.168, se = 0.236, Pr ( > |z|) = 7.56e-07), for which responses varied depending on the genotype (Tables 2, 3 and Figures 2A,C). Heat did not produce any significant effect on chl a concentration. Table 2. Results from linear mixed-effects model on the effects of different treatments on Fv/Fm and chl a concentration, using control as the reference category (intercept). Table 3. Results from generalized linear mixed-effects model on the effects of different treatments on average symbiont density, using control as the reference category (intercept). Figure 2. Average levels of maximum quantum yield (Fv/Fm) (A), chl a concentration (B) and, symbiont density (C) for all genotypes and different treatments. Box plots show median values (solid horizontal line), interquartile range (box outline) and highest and lowest extremes (whiskers). The main effect of sediment alone on all of the photo-physiological parameters examined was not significant. However, there were some genotype-dependent significant effects of sediment on average symbiont density (Table 3 and Figure 2C). 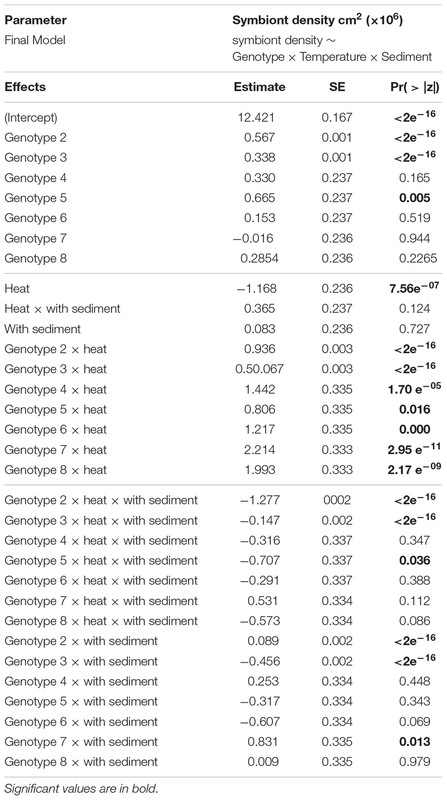 A combined effect of heat and sediment was observed for chl a concentration (F-value = 6.119, p-value = 0.0193, Figure 2B) and responses of corals to these combined factors varied in terms of average symbiont density. Combined raw reads from 3 lanes for each cDNA library (×36 libraries) ranged from 14.4 million (∼3.63 Gb) to 57.1 million reads (∼14.32 Gb) [Supplementary Table 2]. After quality trimming, we obtained an average of ∼24 million high-quality reads per cDNA library (NCBI BioProject: PRJNA435468). 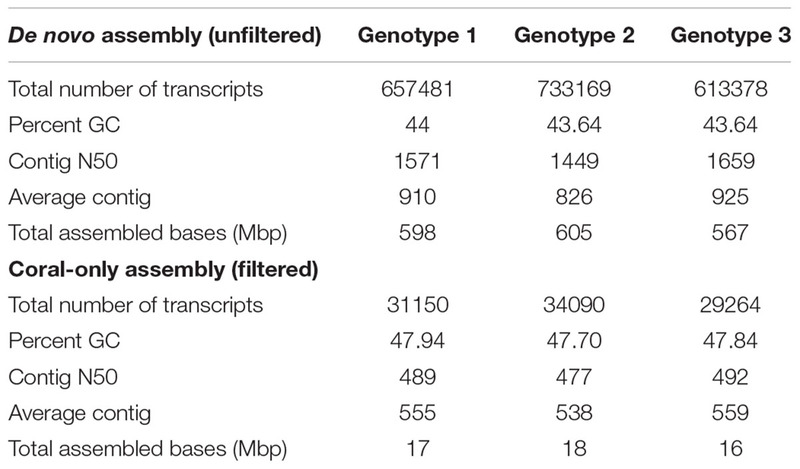 De novo transcriptome assembly for each genotype produced a total of 613,378–733,169 transcripts with N50 of ∼1449–1659 and an average of ∼590 megabase pairs (Mbp) assembled (Table 4). An average of ∼38% of the total assembled transcripts for each genotype were predicted to be protein-coding genes. After filtering redundant transcripts and sequences that matched rRNAs and Symbiodiniaceae, an average of ∼31,501 transcripts were identified as putatively coral in origin (designated here as final ‘coral-only’ reference assembly), which is comparable to published coral transcriptome resources in Traylor-Knowles et al. (2011); Barshis et al. (2013), and Shinzato et al. (2014). Table 4. Summary statistics of de novo assemblies. 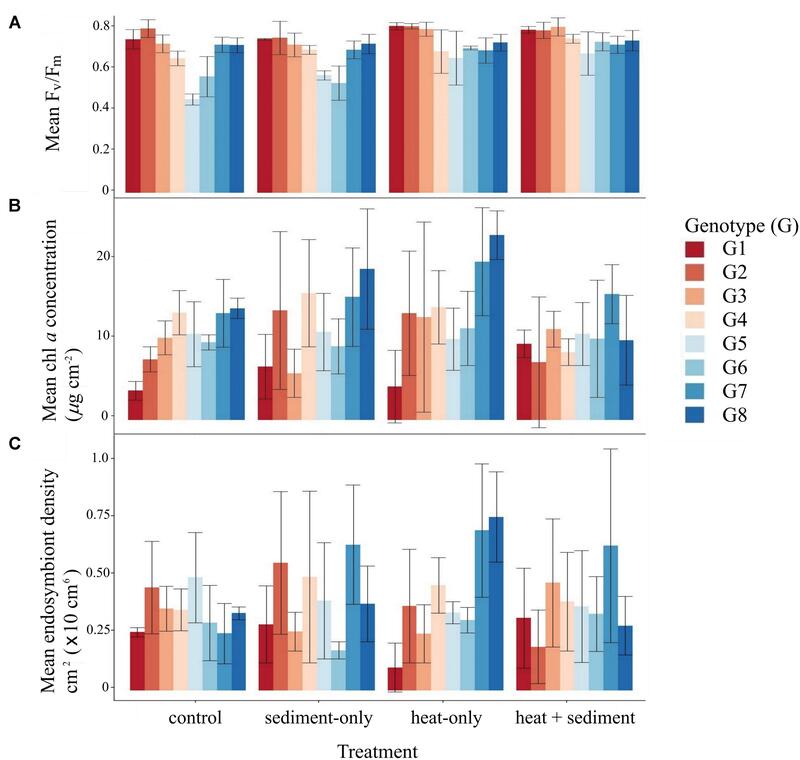 Principal component analysis and heat maps show that corals subjected to heat (i.e., “H” and “H+S”) had similar gene expression profiles while samples maintained at ambient temperature (i.e., “C” and “S”) responded similarly as well (Supplementary Figures 2, 3). EDGE analysis resulted in 824 significant DETs (significance based on 5% FDR correction) from all genotypes (Supplementary Table 3). Results from pairwise comparisons showed significant differences in transcript expression levels for corals exposed to both treatments “H” and “H+S.” Only a few DETs (3) were found for corals in the treatment “S”. Of the total number of DETs (824), 306 were shared between pairwise treatment comparisons: “C” vs. “H” and “C” vs. “H+S,” while a number of DETs were specific to a treatment comparison. The largest number of unique DETs was found in the comparison between “C” vs. “H” (423), followed by “C” vs. “H+S” (91) and lastly, “C” versus “S” (3) (Figure 3A and Supplementary Table 4). Figure 3. Venn diagram showing overall number of differentially expressed transcripts (DETs) from RNA-Seq analysis which are shared and specific to three different treatment comparisons: control vs. heat-only, control vs. heat + sediment and, control vs. sediment-only (A); and number of DETs with unique protein matches that are shared and unique for each of the treatment comparison (B). Alignment of DETs to Uniprot protein sequences resulted in 174 unique genes for all treatment comparison and genotypes. A substantial number of DETs (212) did not match to any protein sequence in Uniprot database and therefore were excluded from downstream analyses as their functions were difficult to predict. From the total number of unique genes (174), 58 were shared between treatment comparisons: “C” vs. “H” and “C” vs. “H+S” while only a single gene was shared between “C” vs. “H” and “C” vs. “S.” There were 112 genes specific for treatment comparison: “C” vs. “H,” while only 2 genes and a single gene were specific for “C” vs. “S” and “C” vs. “H+S,” respectively (Figure 3B). Overall, 60 genes present in all genotypes were found to be core genes (DEGs, hereon) involved in the responses observed. From the 60 DEGs identified, only 40 genes had known GO terms for drawing biological inferences. We obtained 23 GO categories associated with various biological processes based on UniProtKB that were represented by mostly one gene for each category and two or more genes for some categories such as cell cycle, cilia motility, cilium biogenesis/degradation, stress responses, spermatogenesis, innate immune response and apoptosis. All DEGs had average fold change (FC) ranging from 2.18 to 46.54 for up-regulated genes (red) and -33.77 to -1.89 (blue) for down-regulated genes (Figure 4 and Supplementary Table 5). While the genes specific to “C” vs. “S” were not common in all genotypes, results are shown in Figure 4 for comparisons with other treatments. Figure 4. Heat map showing functional categories based on UniProtKB, gene IDs and expression patterns [lowest fold change (FC) in blue to highest FC in red] of differentially expressed genes (DEGs) across genotypes – G1, G2, and G3; and across treatment comparisons: “C” vs. “H” and “C” vs. “H+S.” While there was no DEG found for the comparison: control vs. sediment-only which is common across three genotypes, genes specific to this treatment and genotypes are included here for comparative purposes. Patterns of expression (up- or down-regulated) for most DEGs were relatively similar among genotypes. However, it is notable that the expression of SVEP1 (associated to cell adhesion) in response to “H” showed positive regulation for G2 while it was highly down-regulated (FC: -33.78) for G3. On the other hand, G1 only expressed SVEP1 when exposed to “H+S” and even showed an up-regulated expression (FC: 4.07) (Supplementary Table 5). There was also variation in the expression pattern observed for the gene DYDC1 (associated with chromatin silencing at telomere) which was up-regulated for G1 under “H+S.” In contrast, DYDC1 was down-regulated for G2 and G3 for both treatment comparisons. Interestingly, DNAJB13 was only specific for the treatment comparison “C” vs. “H+S” whereby all three genotypes showed down-regulation of this gene (FC range: -4.80 – -3.44). Furthermore, there were genes that showed similar patterns of expression among genotypes, but the magnitudes of expression varied. For instance, the gene NFKB1 (associated to innate immune response) was highly up-regulated for genotype G2 (FC range: 40.42 – 46.54) but less up-regulated for genotypes G1 (FC range: 3.44 – 6.29) and G3 (FC: 2.18). Another gene that showed different levels of up-regulation was Gpsm1 (associated with cell differentiation) which was highly up-regulated particularly for genotypes G2 and G3 (FC range: 23.41 – 32.47) but less up-regulated (FC range: 3.11 – 5.04) for genotype G1. Our experiment tested how different genotypes of Pocillopora acuta respond to heat and sediment, as individual stressors and in combination. Both traditional photo-physiological metrics and RNA-Seq data were used to determine responses of P. acuta to these stressors. We showed that heat was the main factor driving the changes in photo-physiological conditions and gene expression patterns among genotypes. The effects of exposure to sediment alone were much weaker. Notably, when sediment was combined with heat, significant responses were observed that suggest a synergistic effect of the two factors. The most apparent effect on photo-physiological performance was due to heat exposure alone. Thermal anomalies cause changes in photosynthetic functions such as degradation of Photosystem II (PSII; Warner et al., 1999), a light-harvesting complex crucial for photosynthesis. One of the most informative measurements for the photo-biology of the coral-Symbiodiniaceae relationship is the maximum quantum yield (Fv/Fm), which represents the maximum capacity of PSII (Roth, 2014). In our study, the significant effect of heat in Fv/Fm is in line with the elevated abundance of Symbiodiniaceae (Tables 2, 3 and Figures 2A,C). The significant increase in the average density of symbionts in corals under heat stress is likely an adaptive response. It is well known that Symbiodiniaceae abundance in corals is controlled in part by the coral host, which optimizes symbiont abundance to match its environment (Cunning, 2013), thereby controlling the net benefit of their symbiosis (Hoogenboom et al., 2010). While heat is considered a strong driver of coral bleaching (Brown, 1997; Woolridge, 2013), an increase in temperature can drive nitrogen fixation which, in turn, can stimulate cell division in the endosymbionts (Rädecker et al., 2017). Therefore, it is conceivable that the active regulation of symbiont density which resulted in a significant effect in photosynthetic yield is associated with the acclimatization capacity of P. acuta under suboptimal conditions. Reduced light penetration due to sediment exposure was previously shown to affect coral photo-physiology (reviewed in Erftemeijer et al., 2012). In this study, exposure to sediment did not cause major changes in the photo-physiological performance of the corals except for significant changes in average symbiont density for some genotypes (Table 3 and Figure 2C). When sediment and heat were combined, there were significant effects on the performance of corals, but these were less obvious than those caused by heat alone. The decrease in average symbiont densities in corals exposed to “S,” and “H+S,” was likely due to the reduction of photosynthetically fixed carbon in low light conditions, which can affect the maintenance and growth of algal cells (Davy et al., 2012). Although reduction in symbiont density under low light might be considered a negative consequence, this can also represent an adaptive strategy to alleviate self-shading of cells to optimize light capture (McCloskey and Muscatine, 1984). Maximum quantum yield for corals exposed to sediment did not change significantly (Table 2 and Figure 2A), suggesting that reduction in symbiont density observed here is an optimization strategy of P. acuta to maximize benefit from symbiosis in response to environmental change. While photo-physiological measurements are useful for examining coral responses to stress, these are only proxy measurements derived from the algal symbionts and may not necessarily represent the condition of the coral host. Studies are now uncovering mechanisms of responses by both the coral host and its symbionts through transcriptome-level approaches (Mayfield et al., 2014; Shinzato et al., 2014). Changes in environmental conditions can affect an organism’s transcriptional state whereby gene expression levels are orchestrated to match the surrounding environment (Kenkel and Matz, 2016). In general, results of the RNA-Seq analysis aligned well with the photo-physiological results. Significant DEGs were found for all coral genotypes exposed to “H” and “H+S,” but very few for corals exposed to “S” (and only for G2 and G3). Below, we discuss the main genes (DEGs) involved in the response of P. acuta to acute heat and sediment exposure. These genes are from different functional categories associated with various biological processes that are well conserved and are critical for the survival of various metazoans including corals. Thermal stress is known to up-regulate heat-shock protein production (Advani et al., 2016; Maor-Landaw and Levy, 2016). We observed increased gene expression (FC range: 4.281 – 18.560) of small heat shock proteins (sHsps), heat shock proteins (Hsps) Hsp16.1 and Hsp16.2 which are believed to respond specifically to heat stress (Gates and Edmunds, 1999; Ding and Candido, 2000). The gene sip1, which encodes a stress-induced protein as a result of a heat stimulus, was also up-regulated (FC range: 4.69 – 9.64). These genes help alleviate the negative impact of high temperature levels by means of reducing the number of structurally non-native proteins, believed to be produced by heat-stressed symbionts (Lesser, 1997), and refolding reversibly heat-damaged proteins. While several studies have shown Hsps to be involved in coral heat stress (Maor-Landaw and Levy, 2016), responses among Hsps can be variable. For instance, in a previous gene expression study by Barshis et al. (2013) on Acropora hyacinthus from two different populations, characterized as ‘thermally tolerant’ and more ‘sensitive population,’ the authors noted the absence of Hsps in the shared-response genes to thermal exposure. The canonical heat stress genes including Hsp70 and sHsps (Hsp23/HSPB1 and Hsp16.2) were found to have lower reactivity to heat stress particularly for the thermally tolerant population. For Hsp70, it was implicated in frontloading (i.e., higher expression under ambient conditions), which may prepare a coral individual for frequent stress. Conversely, the reduced transcription of sHsps was likely due to lower levels of physiological stress experienced by an individual. 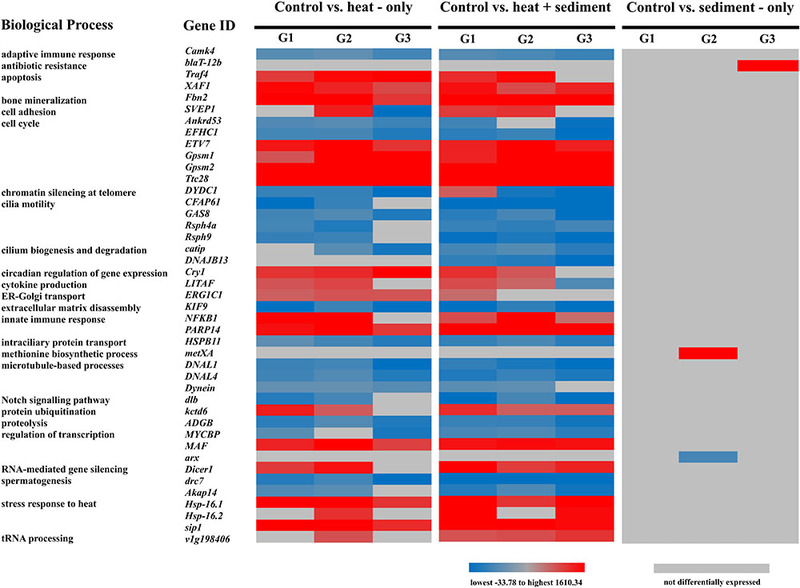 Our results, nevertheless, correspond to specific genes previously highlighted to respond to heat stress, including sHsps (Kenkel et al., 2011, 2014). The varying response of Hsps further underscores differential responses to thermal exposure among coral species. Beyond the canonical Hsps, a set of cilia-related genes were significantly down-regulated. These genes are associated with cilium biogenesis and degradation, as well as cilia motility. Coral surfaces are densely covered by cilia, particularly in the pharynx of the polyps (Westbroek et al., 1980). Cilia-related activities include cleaning trapped sediment particles, which may contain pathogenic bacteria, off surfaces of coral colonies (Erftemeijer et al., 2012). More recently, ciliary structures in corals have been reported to actively enhance nutrient exchange with their surrounding environments through ciliary beating (Shapiro et al., 2014). It has been shown that ciliary beating is very tightly correlated with temperature which can cause defects in ciliary functions (Clary-Meinesz et al., 1992). The observed down-regulation of genes associated with cilia motility, i.e., growth arrest-specific protein 8 (GAS8), radial spoke head protein homologs 4a and 9 (Rsph4a and Rsph9) and cilia- and flagella-associated protein 69 (CFAP69), suggest a shutdown in feeding mechanisms of corals to divert resources to a stress response (Traylor-Knowles et al., 2017). As a mechanism of sensory signal adaptation, cilium exhibits adjustment to its morphology in response to changes in environmental conditions (Malicki and Johnson, 2017). Therefore, it is reasonable that the regulation of genes associated with cilium biogenesis and degradation constitutes part of the stress response. Corals, like most animals, rely heavily on their immune response for protection from invading pathogenic organisms. In this experiment, we found DEGs associated with both adaptive and innate immune responses. Innate immunity is characterized as the non-specific first line of defense mechanism of organisms against any foreign bodies which may be harmful to them. Conversely, adaptive immunity involves more specific responses and is believed to be more complex than innate immunity as it involves a “memory” that facilitates future responses against specific stressors (Janeway et al., 2001). While cnidarians do not possess specialized immune cells, they are known to exhibit specific allorecognition characteristics believed to protect colonial cnidarians from fusion with genetically different individuals and from pathogenic organisms (Francis, 1973; Sebens, 1984; Miller et al., 2007). Interestingly, a recent report on the genome of Pocillopora damicornis has shown that immune strategies in this species have adaptive roles (Cunning et al., 2018). The immunity-related genes identified in this study included calcium/calmodulin-dependent protein kinase type IV (CAMK4) associated with adaptive immune response and two innate immunity genes such as nuclear factor NF-kappa-B p105 subunit (NFKB1) and poly (ADP-ribose) polymerase 14 (PARP14). The genes NFKB1 and CAMK4 are part of transduction signaling pathways that are activated following the detection of stress by toll-like receptors (van de Water et al., 2015). These downstream signaling pathways are essential for regulating expression of target genes involved in immunity and cell survival. Here, exposure of corals to heat triggered up-regulation of NFKB1 (FC range: 2.178 – 243.889) and a downregulation of CAMK4 (FC range: -6.548 – -2.369). The latter gene is a serine/threonine-specific protein kinase, which is regulated by the presence of Ca2+/ calmodulin complex believed to be a mediator for memory associated with the adaptive immune response and crucial for various cellular processes (De Salvo et al., 2008). Almost all types of stressors have a common oxidative stress phase which triggers an increase in calcium concentration eventually leading to disruption in calcium homeostasis in the cell. The down-regulation of CAMK4 observed here suggests a disruption in Ca2+ homeostasis which signals cell death, or apoptosis (Maor-Landaw and Levy, 2016). This is corroborated by significant increases in expression levels (FC range: 4.675 – 15.107) of two known regulators of apoptosis, TNF receptor-associated factor 4 (TRAF4) and XIAP-associated factor 1 (XAF1). Interestingly, the gene PARP14 which is associated with anti-apoptotic pathway showed significant up-regulation (FC range: 2.12 – 99.56). These results suggest a complex orchestration of the immune system in corals when exposed to stressful conditions. Furthermore, a number of genes that are part of signaling pathways associated with the control of cell proliferation (Davy et al., 2012) were detected. On the one hand, Ttc28 and Gpsm2 were highly expressed in terms of the number of transcripts with 131 and 28 DETs respectively (Supplementary Table 4). Ttc28 is involved in checkpoint-mediated cell-cycle while Gpsm2 modulates activation of chemoreceptor G-protein. On the other hand, two other genes, Ankrd53 and EFHC1, were down-regulated. Ankrd53 is known to be involved in normal regulation of cell division while EFHC1 is a microtubule-associated protein involved in enhancing calcium influx and may stimulate apoptosis. Cell-cycle arrest and apoptosis due to DNA damage are part of a conserved pathway in multicellular organisms (Gartner et al., 2000). It is possible that these genes, as checkpoint controls, could mediate detrimental effects of stressful conditions on corals that are essential for their survival. To ensure genomic stability of organisms, surveillance mechanisms (i.e., checkpoint controls) are essential to interrupt cell cycle progression that can be damaging to the genome (Gartner et al., 2000). The coordinated cell cycle and growth for multicellular organisms is necessary for their development (Goranov et al., 2009). In our study, the suppression in the cell cycle is corroborated by down-regulation of the gene KIF9 which encodes for a kinesin-like protein linked to extracellular matrix disassembly. It is well known that the physiological process associated with coral growth, i.e., calcification, is regulated by exogenous factors such as light and temperature (Lough and Barnes, 2000; Lough and Cooper, 2011). Calcification takes place directly within the extracellular calcifying matrix, or ECM (Cohen and McConnaughey, 2003; Allemand et al., 2011). In a previous study by Helman et al. (2008), coral cells were reported to maintain the ability to precipitate calcium carbonate on an ECM in vitro. For reef-building corals such as P. acuta, growth is a key strategy, hence, regulation in their calcification process is crucial to their development. A significant down-regulation of DNAJB13, a gene associated with cilium biogenesis and degradation (Figure 4 and Supplementary Table 5), was observed to respond specifically to treatment “H+S”. Ciliary movement in corals for self-cleaning and manipulation of sediments that settled on them can incur a sub-lethal energetic cost (Pechenik, 2006), and may have direct impacts on ciliary structures. Considering the detrimental effects of heat on ciliary functions (Clary-Meinesz et al., 1992), combining it with sediment here led to a synergistic effect on corals’ ability to assemble and disassemble their ciliary structures. As cilia perform important functions for corals (e.g., for sediment rejection and feeding), a reduction in their capacity to continuously maintain their ciliary structures would therefore affect their survival. Interestingly, exposure to “S” induced up-regulation (FC: 1610.339) of the gene blaT-12b, which encodes the protein beta-lactamase TEM-12 in antibiotic resistance. Although presence of this gene was only detected in G3, it has implications on corals’ ability to fight antibiotic resistance against invading bacteria. A similar study by Sheridan et al. (2014) that used sterile sediments for acute sediment exposure on corals showed significant up-regulation of the melanin synthesis pathway– a key response to immune challenges in invertebrates (Cerenius and Söderhäll, 2004). A cascade of events in this pathway provides an antimicrobial defense to the organism, from production of melanin precursors and metabolites to formation of the melanin barrier which isolate the compromised tissue or physical lesions of the organism from pathogens or any other sources of infection (Cotter and Wilson, 2002; Cerenius et al., 2010; Palmer et al., 2010). Such observations can be linked to mechanical damage due to sediment abrasion, which may elevate the risk of pathogen exposure (Lamb et al., 2016). Apart from the mechanical effects of sediment exposure, reduction in light penetration can lower photosynthetic yield (Weber et al., 2012). The capacity of corals to meet their metabolic needs was previously shown by Fitzgerald and Szmant (1997) to involve methionine heavily. This may explain the observed up-regulation of metXA (FC: 72.238)—associated with methionine biosynthesis—in G2 when exposed to sediment. While the levels of gene expression were relatively similar across genotypes for many different genes, some genes exhibited different patterns. For instance, the gene SVEP1 which is associated with cell adhesion was highly down-regulated in response to “H” for G3 (FC: -33.78) but up-regulated for both G1 (FC: 4.07) and G2 (FC: 5.20). This gene is classified as active in the extracellular region based on the ‘Cellular Component’ GO category. For maintenance of multicellularity in cnidarians (including corals), ECM is produced to facilitate cell-cell adhesion and cell-substrate organization (Helman et al., 2008; Magie and Martindale, 2008). It is likely that down-regulation of SVEP1 for G3 is related to the disruption of ECM production, which may have an effect on the calcification process. While Fbn2—associated with positive regulation in bone mineralization—is up-regulated in G3 in response to “H” (FC: 4.27) and “H+S” (FC: 7.58), the magnitude of up-regulation is not as high compared to G1 (FC: 23.29 and 15.20) and G2 (FC: 17.34 and 15.40). This suggests a reduced capacity of G3 to regulate skeletal calcification under stressful conditions as compared to other genotypes. Our findings provide important biological insight into the capacity of P. acuta to respond to short-term disturbances by means of adjustments in their photo-physiological performances and gene expression. This could help explain a shift in the bleaching pattern of P. acuta (i.e., to being less susceptible) during recent coral bleaching events in Singapore. The functional DEGs discussed here provide opportunities for future validation studies to examine specific genes in concert with direct measurements of the associated phenotypes. Considering that the responses observed in this study occur at the level of gene regulation, it is also important to measure the actual turnover of protein products which are subject to further regulation. This will deepen our understanding of the cellular behavior of corals under stressful conditions. Heat has been the most widely studied environmental stressor on corals, however, its effects in combination with other variables are not well understood. The present study helps to fill this knowledge gap. Our results show that heat was a strong driver of the observed responses, but we also found synergistic effects of heat and sediment on the ability of corals to maintain their ciliary structures (i.e., cilium biogenesis and degradation), an essential component for coral survival. Sustained periods of high temperatures, particularly during the summer, can potentially magnify the impacts of other environmental stressors (chronic or acute) and can be lethal for corals, especially in inshore shallow waters. The fate of coral reefs in the Anthropocene will depend largely on the capacity of reef-building corals to acclimatize to a rapidly changing environment. Only genotypes that exhibit this ability are likely to survive. The raw reads used for this study can be found in the NCBI BioProject ID PRJNA435468 (https://www.ncbi.nlm.nih.gov/bioproject/435468). All supplementary data can be found in https://doi.org/10.6084/m9.figshare.6163916. All authors contributed conception and design of the study. RCP-D carried out the experiments, organized the data, and performed the statistical analysis. RCP-D and M contributed in the RNA-Seq analysis. All authors contributed to manuscript revision, read and approved the submitted version. This work was supported by the National Research Foundation, Prime Minister’s Office, Singapore under its Marine Science Research and Development Program (Award Nos. MSRDP-P03 and MSRDP-P05). Additional support was provided by the Southeast Asian Biodiversity Genomics Center (R-154-000-648-646), and the Maritime and Port Authority (MPA) of Singapore (R-347-000-215-490). The reviewer BW declared a past co-authorship with several of the authors, LC, PT, and DH, to the handling Editor. We would like to acknowledge the St. John’s Island National Marine Laboratory for providing the facility necessary for conducting the research. The Laboratory is a National Research Infrastructure under the National Research Foundation Singapore. Many thanks to the members of Experimental Marine Ecology Laboratory and Reef Ecology Laboratory at the Department of Biological Sciences and the Marine Biology and Ecology Laboratory at Tropical Marine Science Institute, NUS, for fieldwork and laboratory support. Thank you also to Dr. David Suggett for allowing us to visit his laboratory at University of Technology, Sydney to observe their daily operations. All fieldwork was conducted under the National Parks research permits NP/RP13-082 and NP/RP15-009a with permission from MPA. High-throughput sequencing work was performed by the Singapore Centre for Environmental Life Sciences Engineering sequencing facility (http://www.scelse.sg/). The computational work for this study was partially performed on resources of the National Supercomputing Center, Singapore (https://www.nscc.sg). Comments from Drs. Eslam Osman, Michael Sweet, Bryan Wilson and an reviewer greatly improved this manuscript. Chansang, H., Phongsuwan, N., and Boonyanate, P. (1992). “Growth of corals under effect of sedimentation along the northwest coast of Phuket Island, Thailand,” in Proceedings of the Seventh International Coral Reef Symposium, Guam, 241–248. Cunning, R. (2013). The Role of Algal Symbiont Community Dynamics in Reef Coral Responses to Global Climate Change. Doctoral dissertation, University of Miami, Florida. Falkowski, K. E., Jokiel, P. L., and Kinzie, R. A. (1990). “Irradiance and corals,” in Ecosystems of the World 25: Coral Reefs, ed. Z. Dubinsky (Amsterdam: Elsevier), 89–107. Janeway, C. A., Travers, P., Walport, M., and Shlomchik, M. J. (eds). (2001). “Principles of innate and adaptive immunity,” in Immunobiology: The Immune System in Health and Disease, 5th Edn. (New York, NY: Garland Sciences). Lui, G. C. Y., Setiawan, W., Todd, P. A., and Erftemeijer, P. L. A. (2012). Among genotype variation for sediment rejection in the reef building coral Diploastrea heliopora (Lamarck, 1816). Raffles Bull. Zool. 60, 525–531. National Oceanic and Atmospheric Administration Coral Reef Watch (2000). NOAA Coral Reef Watch 50-km Satellite Virtual Station Time Series Data, Updated Twice-Weekly, for Singapore; January 1, 2014- December 31, 2015. Silver Spring MD: NOAA Coral Reef Watch. Zainal, A. J. M., Dalby, D. H., and Robinson, I. S. (1993). Monitoring marine ecological changes on the east coast of Bahrain with Landsat TM. Photogramm. Eng. Rem. Sens. 59, 415–421. Copyright © 2019 Poquita-Du, Huang, Chou, Mrinalini and Todd. This is an open-access article distributed under the terms of the Creative Commons Attribution License (CC BY). The use, distribution or reproduction in other forums is permitted, provided the original author(s) and the copyright owner(s) are credited and that the original publication in this journal is cited, in accordance with accepted academic practice. No use, distribution or reproduction is permitted which does not comply with these terms.